The MPD-480.3P-75KVA-208Y.120-5X100A portable power distribution system is designed to enable operators to connect to 480V three phase primary voltage and step it down to 208Y/120V three phase to operate lights and equipment. Operators can connect to 480V power sources using the 20` of included 2/4 Type-W cord on the input side. On the secondary side, operators can connect up to five 208V devices via five 100-amp pin and sleeve receptacles. This versatile system enables operators to make the most of a single 480V 3-phase connection. Operation: The included 20` 2/4 Type-W line-in cord brings 480V three phase power to the NEMA 3R 100-amp primary disconnect. This primary disconnect contains three 90-amp time delay fuse breakers protecting the transformer. The NEMA 3R transformer steps down 480V three phase power to 208Y/120 three phase and passes the current to the secondary side. The secondary side of the transformer features five watertight IEC 60309 4100R12W 100-amp pin and sleeve receptacles that allow operators to connect five 208V devices. All receptacles are equipped with waterproof covers. Protective Construction: Unlike many portable power distribution boxes made of plastic and utilizing thin gauge, low grade metals in their construction, this unit is designed for serious use and is ruggedly constructed to withstand demanding conditions and heavy duty industrial applications. The transformer and load assembly is mounted on a 3/16" thick carbon steel mounting platform and the load center/distribution assembly is mounted to the standard 2" x 2" x 1/8" square carbon steel tubing frame, resulting in an extremely stable, durable and well protected power distribution platform. This model is equipped with forklift skid pockets, locking polyurethane casters, and a top located lifting eyelet which allows easy lifting with cable or chain hooks. This can be replaced for an additional cost with stainless steel, hot dip galvanized steel, or aluminum depending on the customer`s needs. 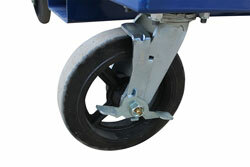 Larger units are available upon request and can be equipped with skids or trailer mounted.